To begin with, how was the concept of “City Centre Beirut” born?City Centre Beirut is part of a long-term expansion plan for Majid Al Futtaim Properties across the Middle East and North Africa region. Lebanon is a major pillar in our planned expansion. City Centre Beirut is part of a long-term expansion plan for Majid Al Futtaim Properties across the Middle East and North Africa region. Lebanon is a major pillar in our planned expansion, given the high potential of the local retail sector and strong tourism. Our studies have shown that the Greater Beirut area was underserved by shopping centers, and we found the perfect location in Hazmieh; a very well connected suburb with proximity to populated areas and a vibrant road network. What are the attributes of City Centre Beirut? What differentiates it from the other shopping malls which are present in Lebanon? 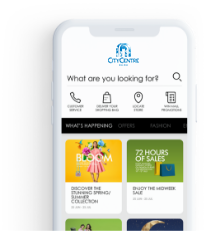 A customer centered and friendly shopping destination targeting different age groups and interests offering ease of shop access and ease of shopping experience. A successful tenant mix which best suits the demands of the community and the City Centre Beirut profile, where the customers are well served in their shopping needs and feel good about visiting the property. City Centre Beirut customers can now choose from thousands of grocery items under one roof with the opening of the 1st Carrefour Hypermarket in Lebanon. For a matchless luxurious cinema experience! City Centre Beirut will be hosting the Middle East's most innovative and exciting cinema and entertainment provider VOX Cinema! VOX Cinemas guarantees our customers the most immersive and compelling cinema experience in the region! City Centre Beirut customers will enjoy hours of fun-filled activities, games and attractions for the whole family at MAGIC PLANET, featuring: Amusement rides, motion simulator driving game, prize games & soft play area for children (In-door & Out-door). An exceptionally designed and innovative indoor plaza that is contiguous with counters of multiple food vendors for self-serve dining. Why did you decide to invest in Lebanon? Do you believe that Lebanon is a lucrative market in terms of investments? We are committed to bringing a truly unique shopping and lifestyle destination to the Beirut community in 2013. We are here for the long term and we believe Lebanon’s retail sector is poised for strong growth. To what extent does “City Centre Beirut” help invigorate the Lebanese economy? Shopping mall developments are generally powerful contributors to the respective local economy and community. They create a significant number of jobs across a wide range of sectors, they add to the value of the real estate around them and support trade and tourism. In addition to more than 2,500 jobs generated during the construction phase, City Centre Beirut will provide more than 1,200 permanent job opportunities. To what extent does “City Centre Beirut” combine between shopping and entertainment at once? City Centre Beirut is truly a one stop attraction for shopping, food and fun. It is one of the largest and most complete shopping malls in Lebanon, featuring VOX Cinema, Magic Planet, anchor tenants as: Carrefour , Centrepoint, H&M, Marks & Spencer…. the largest food court in the country and a selection of fine dinning restaurant at the rooftop. “City Centre Beirut” is considered to be the first investment in the Lebanese market by MAFP. Isn’t this a risk taking into consideration the current political situation on a local and regional level? Do you promise that this is not going to be the only investment in Lebanon? Our shopping mall developments take two to four years to develop and we then manage them for many more years. Therefore our strategic view of the business goes way beyond short-term destabilizing events. Lebanon is a key market for us. We have a broad expansion strategy which will soon include the development of more shopping malls in the next 3-5 years, alongside the progress we are making with the Waterfront City development. To what extent are you taking into consideration sustainable development and being environmentally friendly in the shopping mall? Environmentally friendly attributes are a priority to us, and we will ensure to follow international standards to meet them. For instance, we are targeting LEEDS Silver for sustainable development and construction. Is City Centre Beirut going to be a provider of a large number of job opportunities? During the construction phase, over 2,500 job opportunities were created, and, as stated before, more than 1200 jobs will be created through City Centre Beirut once it opens. This aspect of job creation was reinforced by Career Day, where we offered Lebanese talent promising careers at City Centre Beirut. The event was held on the 3rd of November and received over 5000 resumes, demonstrating the Company’s commitment to developing local communities in its operational markets. When will City Centre Beirut be officially open? City Centre Beirut is set to open at the beginning of the second quarter of 2013. Since key milestones have already been met on schedule, the main focus has now shifted to finalizing work and tenant fit-outs. What are your future aspirations? Do you have any future projects in Lebanon? Majid Al Futtaim Properties has a solid expansion plan across the Middle East and North Africa region. We aim to double our shopping mall portfolio within the next 7-10 years. In addition to our developments in Lebanon, we intend to start construction of Mall of Egypt this quarter, and we are looking into opportunities in Saudi Arabia.